The purpose of this study was to determine the effect of brand image and word of mouth on the purchase intention of consumers of Lapis Kukus Pahlawan in Surabaya. The variables in this study are brand image (X1), word of mouth (X2), and purchase intention (Y). The population in this study were consumers of the Lapis Kukus Pahlawan in Surabaya. The sample in this study were respondents with the characteristics of consumers of Lapis Kukus Pahlawan, residing or domiciled in Surabaya. The analysis technique uses multiple linear regression. The results of the study showed that brand image and word of mouth had a significant effect on the purchase intention of consumers of Lapis Kukus Pahlawan in Surabaya. PUTRI, Husni Indrawati Wijaya. PENGARUH CITRA MEREK DAN WORD OF MOUTH TERHADAP NIAT BELI KONSUMEN LAPIS KUKUS PAHLAWAN DI SURABAYA. 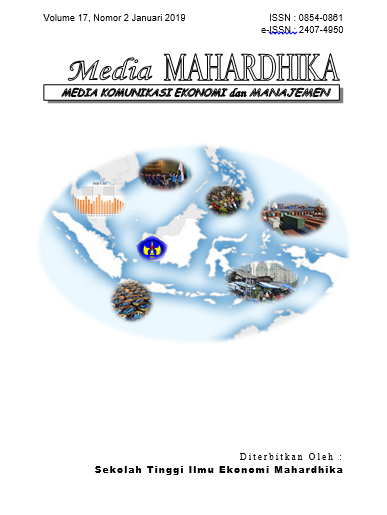 Media Mahardhika, [S.l. ], v. 17, n. 2, p. 184-192, jan. 2019. ISSN 2407-4950. Available at: <http://ojs.stiemahardhika.ac.id/index.php/mahardika/article/view/75>. Date accessed: 24 apr. 2019. doi: http://dx.doi.org/10.29062/mahardika.v17i2.75.